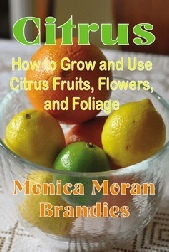 Florida author Monica Brandies has written a fabulous guide to growing and using citrus fruit, Citrus: How to Grow and Use Citrus Fruits, Flowers, and Foliage. This new book is packed with color photos throughout and amazing notes on common and unusual forms of citrus fruits including pummelos, tangelos, blood oranges, limequats, lemons, limes, grapefruits, and many many kinds of oranges. Look for Monica's lectures, book signings, and events which are lined up in many parts of the state. She recently completed the popular second edition of Florida Gardening: The Newcomer's Survival Manual. 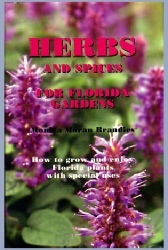 Her classic book, Herbs and Spices for Florida Gardens, is always popular. She has been gardening all her life, publishing since 1961, and raising their nine children since 1959. The youngest, with Down syndrome, is still living at home. Monica brings, sells, and signs books at her many speaking engagements. She has spoken to church groups, plant societies, garden clubs, and other groups with talks that combine inspiration, entertainment, and information. Her articles appear weekly in the Brandon (Florida) News and are often seen in magazines such as Florida Gardening. Monica also performs readings from her memoir, Bless You for the Gifts. For more information on her talks and fees, contact her at monicabrandies@yahoo.com .